Learning a language is a lifetime story. You can never get bored with it. One of the most difficult things for me to remember how to translate well when it comes to food is any word in relation to names of fish. For some reason, it does not matter how long I have lived in the US or in another English-speaking world. After more than ten years by now of my expatriate life, I can see that I am still fighting with the same issues. I explain my incapacity to memorize fish names with a few dominant things. Sometimes, the reason causing my confusion comes from the fact that I only learned about some fish varieties while living here, hence I never learned the French word by experience. Sometimes the reason is that a lot of fish species have many different names, and this particularly confuses me like nothing else! To say the least, things are not made easy for any learner, in any language. Fish are complex! The first time I came across Arctic Char was here in Boston. I fell in love with this fish right away. I learned quickly that in French, this fish is called Omble chevalier although I had never heard about this name while living in France. I hope it will make sense to you, but what it means to me is that if I am told about Arctic Char in English, I have a visual representation of a pink colored fish. If I am told “omble chevalier” in French, I see blank. After looking for information on this particular fish, I found out that omble chevalier is actually a type of trout that belongs to the Salmonidae family. Only living in deep lakes of the Northern hemisphere, it typically looks for colder temperatures, as deep as 80 to 100 meters — which explains why this fish is not common in the summer, and more frequently found in Spring or Autumn. Because Arctic char is not a common fish, it makes it a refined one, of excellent quality. You pretty much can cook it like salmon since it belongs to the same family. Yet to me, there is no comparison. I much prefer it to salmon as I find its flesh more delicate. Note: I realized later on that there are other French names for Arctic Char: truite arctique, truite alpine, omble rouge or truite rouge. In short, Arctic Char is simply a red trout. Had I been told this right at the beginning, this would have made my life much easier. My mum who is generally gourmet rather than gourmande — the true opposite of my dad — has always been known in our family to have a weak tooth for rillettes de porc. Feeling guilty of this weakness of hers — the mother could not possibly teach her children to become gourmands, allons donc ! — anytime there was a jar of rillettes on the table, she used to try to hide her greediness for them. But to no avail, we were not blind. We all knew that what explained the rillettes jar to grow empty was her. Each time, she would grow more guilty, until one day, when we finally found a solution. Here is some background to why. Rillettes de porc are a traditional French pâté-like delicacy that is most of the time made with pork, eaten as a spread on bread, deliciously good and creamy, deliciously fatty as well. Not that I care, but for anyone paying closer attention to their fat intake, it can matter. And my mum cared. Every time she was eating too much rillettes, she felt bad and promised to never buy them again. “Pourquoi ?” (why? ), we wondered. They are good. One day however, we thought of an excellent solution that we decided to bring to the table. Why not make rillettes de poisson. Why not make a fish version? So this is how we started to make fish rillettes, becoming a great substitute for the pork version. Less butter and a touch of cream to make the rillettes smoother, and mainly a mother that felt very content to resume her happy consumption of rillettes. Despite our plan, she continued to buy rillettes de porc nevertheless. She was now found guilty of two weaknesses. 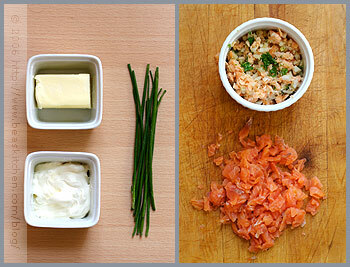 To make these rillettes, you will use fresh fish lightly cooked and smoked fish, such as smoked salmon or smoked trout. I also added a touch of crunchiness with a vegetable like fennel. The lime is a nice addition to balance the salt present in the smoked fish, and the herbs, like coriander and chives, give a flavorful scent. These rillettes can be made ahead of time and kept for a few days in the fridge. They never last too long with us. They are great as finger food, for a buffet, or as a spread on a sandwich. I particularly love the addition of a slice of green acidic apple and a slice of lime. It really brings out a contrast between the saltiness of the fish and the acidic taste of the apple and lime. *If you cannot find Arctic char, use salmon, preferrably Alaskan. Heat 1 Tbsp olive oil in a pan and cook the fish quickly on both sides, for 3 mns. Remove the skin and let cool down before working the fish with your fingers into crumbles. Place it in a bowl. Dice the salmon slices and add them to the cooled cooked fish. 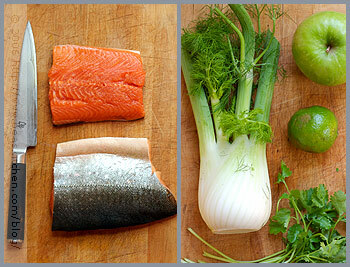 Dice the fennel (white part) and add it to the fish. Add the lime juice and mix well, but make sure to keep the crumble aspect of the preparation. Work the soft butter with a fork and add it to the fish. Mix together. Add the crème fraîche and mix. Place in the fridge for a few hours. Peel the lime and remove all white parts and cut out thin lime slices. Slice the green apple and add a few drop of lemon to prevent oxydation. To serve, toast white bread slices on both sides (4 mn each side at 350 F ). Let cook for 1 mn, remove the edges and cut in triangles. Place in the oven again for a few mns. 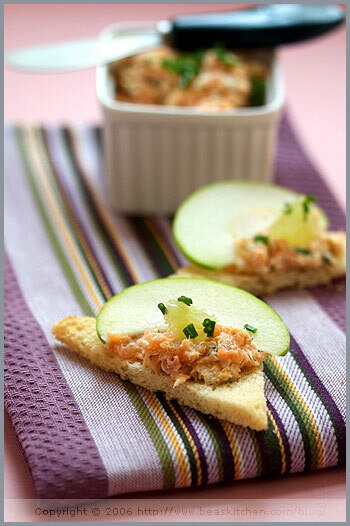 Spread some rillettes on the bread triangles and top with a slice of apple and one of lime. Top with chopped chives. Faites revenir le poisson dans une poêle avec un peu d’huile d’olive, 3 mns de chaque côté. Retirez la peau et laissez refroidir avant de l’émietter. Mettez-le dans un saladier. Coupez le saumon fumé en petits dés et ajoutez-le au poisson cuit refroidi. Ajoutez les herbes hachées, salez et poivrez. Coupez le fenouil (partie blanche) en petits dés, et ajoutez-les au poisson. Mélangez-bien. Ajoutez le jus de citron vert et mélangez. Travaillez le beurre en pommade et ajoutez-le au mélange de poissons. Rajoutez la crème fraîche et mélangez bien. Mettez au frais pendant quelques heures. Pelez les citrons verts à vif, et prélevez de petits quartiers. Coupez les pommes vertes en tranches et citronnez-les pour éviter qu’elles oxydent. Pour servir, faites griller des tranches de pain au four (4 mns de chaque côté, à 180 C). Laissez reposer 1 mn et coupez les bords. Coupez le pain grillé en triangles et repassez-les au four pendant quelques mns. Tartinez les toasts de rillettes, et garnissez avec une tranche de pomme verte et un quartier de citron vert. Décorez avec de la ciboulette hachée. Ah, l’omble chevalier, un beau poisson des lacs Savoyards, Mercotte te le dira si elle passe par ici. Quant aux rillettes, je suis comme ta maman, j’ai un petit faible (petit). J’en ai fait une version au poisson de chez Scally ce weekend, avec des maquereaux fumes. C’est delicieux, mais ta recette a l’air aussi tres subtile et tentante. Je ne connais pas l’omble chevalier mais je ne doute pas que tes rillettes doivent être succulentes. J’aime beaucoup l’idée de présentation: toast,pomme, citron et le croquant du fenouil…un pur délice! yes, those fish translations are really vexing, aren’t they? 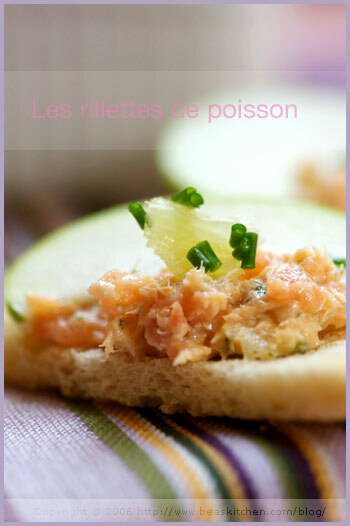 I never tried ‘rillettes de poisson’. Your post makes me feel like having some ‘rillettes de veau’ if I could find any around here…a craving in the making! I had to laugh out LOUD when I read your comment …. I am also an expat, originally from The Netherlands, and I struggle with the same issue !!! Love your photographs… in Boston there is clearly a “change of seasons” whereas in Los Angeles, where I live with my husband, we seem to have “eternal sunshine”…. Au moins je ne suis pas la seule a avoir du mal avec la traduction des especes de poissons. C’est infernal quand mes parents viennent! J’adore manger des rillettes de poisson entre 2 repas de fete alors ta recette tombe a point! I think Julia Child had the same problem with fish. Love the story about your mom! I am sure I felt the earth shake while I was reading this. Maybe I can get our son to make this while we’re in Seattle. It just sounds grand!!! Lovely, lovely! The apple and lime are a great idea. I love fish on bread for a nibble. Mmmmm! Alors, ou est les plats complets? this sounds wonderful, and I can’t remember the names of most fish too, and in Hawaii, they also have Hawaiian names! je fais une recette aussi avec le mélange des deux saumons frais et fumé par contre je note de tester l’ajout de fenouil car il doit exalter le saumon. I*m not new to your blog, but have never left a comment before out of fear of being redundant (I ditto almost every comment!) 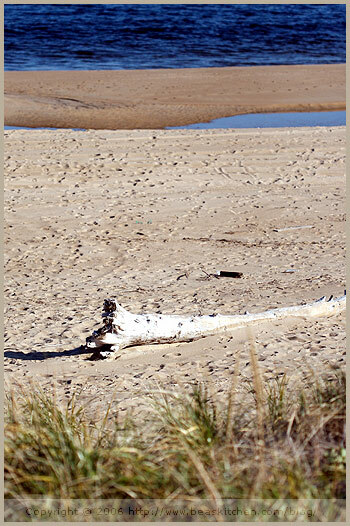 … however, your blog is one of my daily inspirations – merci! I*m an anglo Quebecoise (most people can*t believe there is such a thing!) presently living in Bretagne and have the exact problem with les poissons, except the other way around … phew, I feel much better now knowing that I*m not the only one suffering from this fishy difficulty. I’m always so nervous to try and use Fennel! Smoked salmon is my favorite, thanks for the recipe. Noémie, merci, oui l’omble est vraiment très fin. Marie Champagne, merci beaucoup de votre mot. Ravie que cela vous plaise! David, ah yes, they are really a pain! Serge, this sounds delicious, Rillettes de veau, miam! Paris Lopez, thank you! I am glad to see I am not alone! I bet LA must be diff weatherwise! I like your description of eternal sunshine! Helen, non tu n’es pas la seule. Je suis sûre que si on en parlait, on trouverait beaucoup de choses en commun! Tanna, I hope you succeed with your son 😉 And mainly enjoy your time there. I liked Seattle. Emma, yes a nice combination I am fan of too. Russ, désolée, pas encore de recettes de plats complets ces jours-ci mais il y en aura, il faut que je les teste et les cuisine! Kat, oh boy, Hawaiian names on top? Makes it even more exotic. Anne, ah je suis sûre que ta recette doit êtres exquise. Elle est sur ton blog? Ingrid, merci, tu as bien raison. Lynn, bonjour et bienvenue! I am glad you are visiting and leaving a comment! And oh yes, rest reassured, there surely are common points between you living in France as a native English speaker and me here as a French native speaker. I am convinced we share a lot of language issues. Krista, thanks. I am glad you like it. Bea, that is so strange…I have exactly the same problem but in French. I smell a conspiracy! Oh my! I love Rillettes de porc. My cousin’s husband is from France and he brought me some after he went for a visit to his parents in Paris. I love fish, so this looks splendid indeed! You do a wonderful job on your translations as well as a wonderful blog sight! Ah yes Esther, I think you might be right! Sher, yum, I wonder how long your jar lasted! Jann, thanks a lot for the compliment! J’adore les rillettes de poisson !!! Ces rillettes ont été les reines de notre apéro sur la terrasse ce soir. Heureusement que j’avais triplé les proportions. I ate omble chevalier for only the second time in Semur-en-Auxois (Bourgogne) at the end of August. Delicious. Hadn’t discovered what it is in English so threw it into a search engine and discovered your blog by pure chance. Couldn’t agree more about the complexity of translating fish species. From Semur I was texting a French friend to discover the English for ‘bar’, as in sea-bass. She thought I was talking about somewhere I could get a drink……I’m not that stupid ! The name of that fish confuses me as its often called ‘loup-de-mer’.